Businesses make decisions every day, from choosing new marketing strategies, to integrating greater communication, to choosing the best online time clock. Every business has their own method of doing things. But when it comes to choosing the right number of employees for a project, it can get a little tricky. For example, if you hire too few, the workload can quickly become too much to bear, but if you hire too many, you might end up with employees sitting around playing Angry Birds on their phones all day. 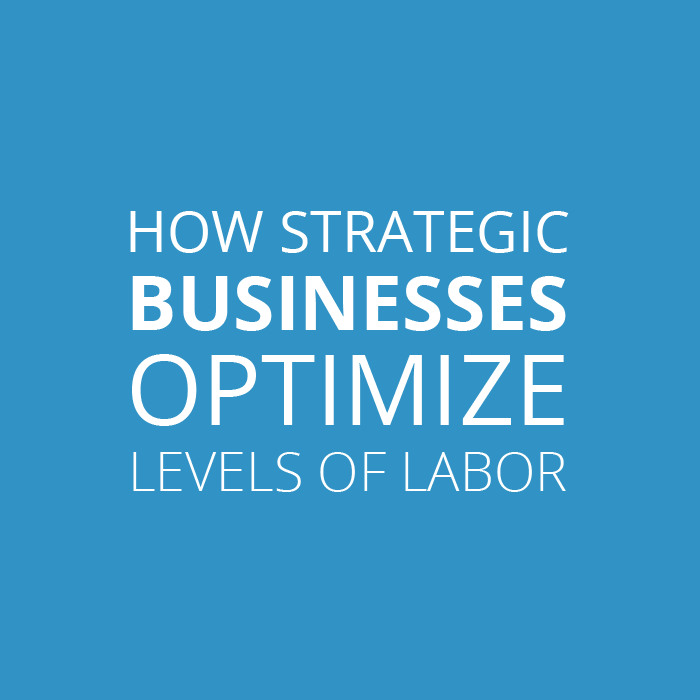 So how can a business determine optimal levels of labor? Using basic economic principles, such as the marginal product of labor, we can easily see how competitive firms choose the right number of employees to hire. To illustrate this idea, let's suppose there is a manufacturing company that produces luxury wristwatches. Situated in a highly competitive, over-saturated market, the company decides to distinguish themselves by creating a special edition micro-sized wristwatch. Priced at only $40, this new watch will be an affordable option for a larger share of people. But in order for the company to produce these watches, they will need to hire a special team (considering that their employees are already busy with the current production load). These specialized employees will make a fixed wage of $2,000 a week. Therefore, the manager of this team is faced with the task of optimizing the levels of labor in hopes to maximize the company's profits. So how many employees should this manager hire? The first step toward reaching this magic number starts with a closer look at the company's labor production. Using the table below, we can see that one employee is able to produce 120 micro watches in a single week. While two employees can produce 220 per week, and three employees can produce 300 per week... etc. 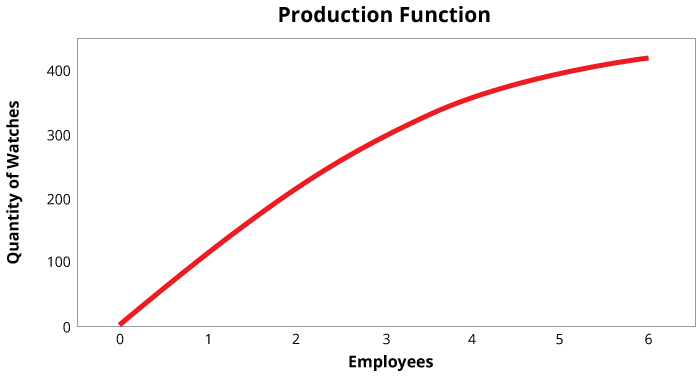 It's also worth noting the marginal product of labor, which is the marginal increase of output correlated to each additional employee. This number is calculated by dividing the change in output (watches) with the change in labor (employees). For example, a change in output from 0 to 120 is simply 120, divided by the change in employee (0 to 1), we simply get 120/1 = 120. While the marginal product of labor is an important piece to the puzzle, the firm is more interested in how this correlates to their profits. Therefore, the next step is to convert the marginal product of labor into a dollar amount. This is simply calculated by multiplying the MPL with the price of the watch, which is $40. This new amount is called the Value of the Marginal Product (VMPL). Since the market price is fixed, we can see that the value of the marginal product is also diminishing. Finally, using the set wages of $2,000 per week, we now have everything we need to calculate the marginal profit, which will ultimately determine how many employees this firm should hire. 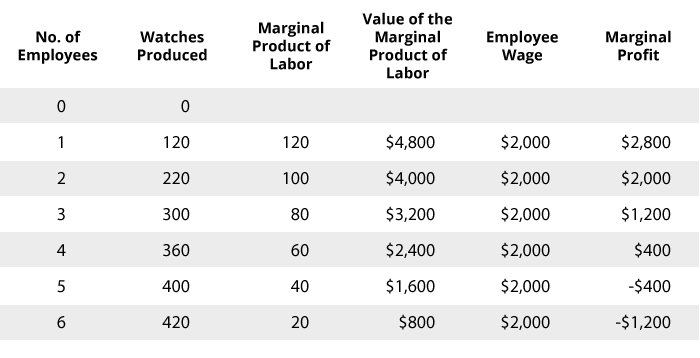 To determine the marginal profits, simply subtract the value of the marginal product from the given wages. For example, the VMPL for only one employee is $4,800. Given that the wage is fixed at $2,000, the marginal profit for the firm is $2,800. For each additional employee, please refer to the chart below. As a result, we can see that the company's marginal profits remain positive with each additional employee up to the fourth employee. Once the firm hires a fifth employee, the marginal profit is reduced by $400. Therefore, the manager of this micro wristwatch project will choose to hire 4 employees. 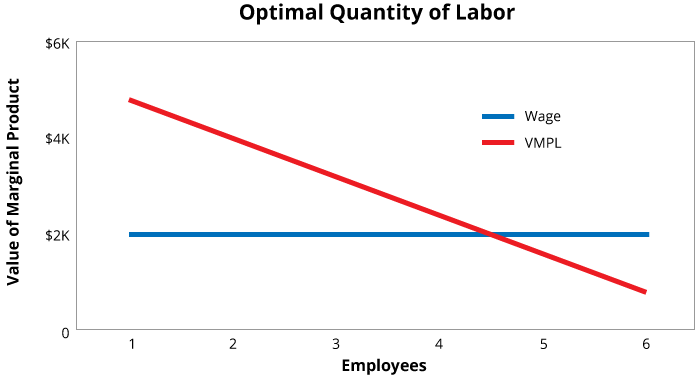 As a general rule for finding the optimal level of labor, profit-maximizing firms should consider setting the value of the marginal product equal to the wages, in order to determine the ideal number of workers. To illustrate this idea, please take a look at the graph below. In this example, we see the optimal level of labor is around 4 and a half. Obviously, the firm can't have half of an employee, so the company must round down to 4. Nonetheless, the firm has successfully chosen their optimal number of employees for the project. This will lead to greater efficiency and productivity, in which employees won't feel overburdened or undervalued. And the company will ultimately maximize their profits. Everyone wins! Therefore, if you're a manager in charge of deciding the levels of labor for a future project, consider using this optimization strategy. To learn more about these concepts, check out Principles of Economics by N. Gregory Mankiw, it's a great resource for information on labor markets.